Constantine Gatsonis, a Henry Ledyard Goddard University professor of biostatistics, joined the Brown University faculty in 1995. 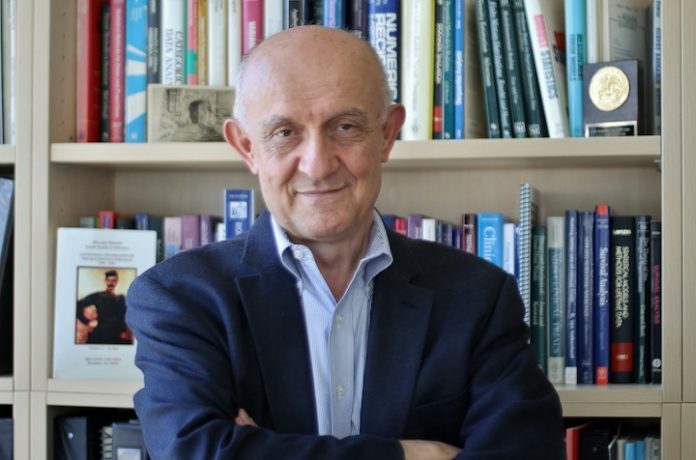 He is the founding director of the Center for Statistical Sciences and the founding chair of the Department of Biostatistics. Gatsonis, a leading authority on the evaluation of diagnostic and screening tests, led the design and data analysis portions of a recent study on the impact of positron emission tomography, or PET, brain scans on the diagnosis and clinical management of dementia patients suspected to have Alzheimer’s disease. Results of the study showed that after 90 days, the scans affected patient care in 60.2% of patients with mild cognitive impairment and 63.5% of patients with dementia. The effort was a national, multi-center study led by scientists at University of California, San Francisco and the Alzheimer’s Association. Providence Business News asked Gatsonis about the study’s methods and findings. PBN: Can you explain what amyloid positron emission tomography is? GATSONIS: PET is a type of nuclear imaging. A radionuclide [radioactive material that has been developed specifically for highlighting abnormalities] is injected in the body and a scan is taken with a camera that recognizes the emissions. In the case of amyloid imaging, the radionuclides are compounds designed to highlight the presence of amyloid plaque accumulation in the brain. PBN: To a lay person, it seems self-evident that new information about a person’s diagnosis would change their treatment. Can you explain the scientific need and significance of this study? GATSONIS: Amyloid PET is a type of scan using compounds that have been approved by [the Food and Drug Administration] in recent years. Three of these compounds were used in this study. The scan can be fairly expensive, it is not widely used and is not yet reimbursed by the Centers for Medicare & Medicaid Services. The scan also provides information about a condition (Alzheimer’s) for which there is no definitive therapy. So the impact of the scan information on medical care of people with symptoms has not been assessed despite the fact that there is growing interest in it. Because of increasing public interest, CMS decided to launch a call for studies that would be used to decide on coverage of the scan – this is called a “coverage with evidence decision” process. The IDEAS investigators responded and put together a public-private partnership that made the study possible. PBN: Are PET scans of Alzheimer’s patients uncommon? GATSONIS: Yes, they are not routine and can be costly. PBN: What sorts of changes in treatment after the scans were documented? GATSONIS: The participants in the study were persons with suspected mild cognitive impairment or with dementia symptoms of uncertain etiology. A large percentage [more than 60%] of participants saw their management change. This included changes in what Alzheimer’s drugs they were receiving, changes in other drugs and changes in counseling. For example, patients with a positive scan [showing presence of plaques] were typically put on Alzheimer’s drugs if they were not receiving them already. Patients with negative scans were taken off medications that were intended for Alzheimer’s. … Patients with positive scans were referred to clinical trials for drugs in development. And so on. PBN: What is the next step in this research? Are you planning a study to test whether the changes observed result in improved treatment/results? GATSONIS: The second step in the study is to examine whether the scan had an impact on health care utilization. In particular, we are examining whether participants had fewer emergency room visits and hospitalizations in the year after the scan, in comparison to Medicare beneficiaries who had similar medical history but were not scanned. This part of the study is using information from Medicare claims data. The hypothesis is that more-appropriate management of patients helps diminish the likelihood of the kinds of hospitalizations and emergency room visits that are commonly seen in elderly persons with symptoms of cognitive impairment. Rob Borkowski is a PBN contributing writer.